I so want to meet the devs one day in person. I don’t know how you do all this day in and day out, but well done and thank you ! Would you be open to a professionally managed, but independent, team of developers to make the push towards Catapult? This is what I would like to see above all. It still feels a little bit like it’s a topic being danced around rather than addressed head on. There are two tasks - creating it and exploiting it. A concerted lean towards the former which gradually tapers and scatters into the latter makes the most sense to this nincompoop at least. The first task needs focus. The second would benefit more from multiple approaches. Good questions and hopefully we receive needed answers with the numbers. We are finalising our response for NEM Labs and we will post it in the next 2 hours. Kristof is on the road right now on his way back from the accountant closing the accounts for 2018. Please clarify to the community the number of developers currently on your team and the number that will be hired by your plan prior to July 1st. What percentage of your headcount and budget is allocated to these positions? Currently, as NEM Europe, we have 3.4 FTE (+1 in on-boarding) developers and testers contributing to crucial parts of Catapult. In total, we have 6.4 FTE technical staff (one is part-time). Prior to July 1st, we will have 9.4 FTE developers and testers contributing to crucial parts of Catapult as well as 1 CTO steering them. In total, we will have 24.35 FTE staff, of which 15.9 are technical staff. By the end of 2019, we will have 16.4 FTE developers and testers contributing to crucial parts of Catapult, and 22.9 FTE technical staff in total. Please share your team’s experiences with managing and hiring developers. How likely is it that you’ll be able to fulfil hiring goals and create a good working environment? During the creation of our detailed business plan, we were mindful about setting realistic objectives for the hiring plan. Finding the right talent for Q2 (which has the highest forecasted team growth ) will be challenging - as hiring always is - but we are confident it can be achieved. More info about the positions we have foreseen can be found here. Over the past year, we have learned a lot about recruiting and managing a distributed team. There are still many areas that can be improved and we are currently adapting to the new project management structure through the PMC. We have an experienced Developer Manager advising us in this process. Based on his input we have provisioned funds for recruitment-related expenses (as part of PERSONNEL AND RELATED EXPENSES category in our budget). This takes into account that some positions will require the involvement of recruiters in order to find and assess suitable candidates. Ideally, the actual expenses will be lower than foreseen but realistically we would be close to what is provisioned in order to meet the hiring goals. An integral part of our plan is to ensure a good working environment for our team. This means providing people with the (software) tools they need in order to do their job properly. We have also provisioned budget for personal development and team building sessions (combined with strategic group sessions). Personal development is crucial to ensure staff retention, and given the remote setup, it is important to get together with the team once in a while. Please describe the main contributions your current team has made to Catapult readiness to date. First and foremost, we want to see the technology move forward. Whoever makes that happen is irrelevant. With the technical management of the project through the PMC, multiple stakeholders can jointly make the push towards Catapult. Many successful open source projects are using this setup and we genuinely believe NEM will become another success story. Our business plan has a clear focus and approach to drive the adoption of Catapult. We are customer demand facing through NEMsp which allows us to gather industry requirements. Being at the forefront of pushing the technology and at the forefront of developing the technology will strengthen the Catapult offering for real-world adoption. Imperative and vital to seeing our technology widely used is by “touching” the people who can utilise its benefits. This includes showing them NEM is the right choice over other protocols, and this can only be done “facing customers”, and meeting the needs of the masses with NEM technology. Please clarify your current financial situation. Is your team in debt, if so how much? In fact, I just came back from a meeting with our (NEM Europe entity) accountant. Some minor final corrections and additions have to be made to the accounts in order to close the accounting year but we will be able to get that sorted out in the coming days. Since the NEM Europe entity was incorporated late 2017 it will be an extended accounting year that spans from incorporation until the end of 2018. Although, I cannot state final numbers; the entity will have generated minor revenue. Over the past couple of months, there were some liquidity issues because of problems with adding new signatories to the Singapore bank. This resulted in a delayed payment from NEM Foundation to NEM Europe. As the entity was not supposed to have a large profit since this would be taxed, it also means that the entity did not have a cash buffer. This resulted in some delayed payments to suppliers (mainly staff). We just received another payment from NEM Foundation to cover for services that were invoiced in Jan and early Feb. This means that we should be able to make up for the delayed payments by the end of this month. So the short answer is that we do not have any debt. What was the headcount of your team in 2018 and how does it compare to current headcount and projected headcount at end of 2019? Our current headcount is 12.35 FTE (total of 11 full time and 3 part time staff members). Maximum headcount in 2018 was 13 FTE. Projected headcount for the end of 2019 is just over 33 FTE. What will happen if your team does not get all desired funding? Are there variations of your proposal that could work at lower funding levels? Would you consider working with one of the other team(s) who have made a successful proposal? First of all, I would like to emphasise how we prepared for this proposal. As described in our business plan, the budget that is provided there will be the absolute maximum spent for 2019 - we have taken great care to be cautious. This means that this is the funding that is required in order for us to be confident in achieving our objectives as set forth in the plan. We are actually planning to use fewer funds than what is budgeted for. The approach to creating the budget was to find the best possible compromise between a light and agile approach, being able to make tangible contributions to the development of Catapult, and being realistic about becoming self-sustaining down the line. We are confident our business plan reflects that absolutely every effort was made, and all measures were taken to ensure our activities benefit the NEM project in as many ways as possible within our scope. For profit activities are actually not just with the intention to become sustainable. All planned for-profit activities will also help improve Catapult or speed up growing the ecosystem. For this reason, we believe that reducing the budget would likely negatively affect the balance in our setup. If strictly necessary to reduce budget requirements we would rather opt for slower team growth than a reduction in scope. Dependency on another entity who has made a successful proposal is not the objective of the NEM Labs proposal. Any strong ecosystem consists of many independent purpose driven entities that solve specific problems for the ecosystem. This is what we are proposing: NEM Labs; an independent, global, technology-focused entity. However, we are looking forward to collaboration with other entities (Example: collaboration between NEM Foundation & NEM Labs). How much XEM will your proposal require at the current (0.04), 4x below (0.01), 4x above (0.16) XEM prices? All of our expenses are locked to FIAT rates so the required budget does not change when the price of XEM goes up or down. That being said, if the XEM price went down, we could revise the hiring plan which will ultimately delay objectives. On the other hand, seeing an increased price will not result in higher expenses. The governance structure we have laid out ensures that we can only spend what has been agreed with the community which is linked to the budget in FIAT. As mentioned in our business plan, it is more likely for the XEM price to go up rather than down. That is why we have included a budget that extends through the entire year of 2020. Please explain details of the independent oversight you will have in place to evaluate your performance. We will have an independent CLG (Company Limited by Guarantee) consisting of long-standing community members, similar to the structure that was set up for NEM Ventures. This CLG will have budgetary oversight over NEM Labs. This too is an important part of our proposal. Accountability to the community is important. We are doing this with the benefit of the NEM project in mind. Having a legal structure where NEM Labs is accountable to a group of independent community representatives will provide the community with peace of mind that funds will be used as per the proposal they voted for. How are you planning to adapt to changing market conditions and evolving priorities with an annual funding cycle? Would it be beneficial to be more agile and request funding from an independent oversight committee more regularly (e.g. monthly or quarterly)? We believe shorter cycles are favourable to adapt to changing market conditions. At the same time, long-term stability is required to attract competent staff. This is why we propose 12 months funding with a quarterly budget release by the independent CLG that controls NEM Labs. What is your vision for NEM and how do you hope to achieve it? empowers people to regain control over their data and digital identity. allows companies to simplify complex processes enabling them to build innovative applications that have a positive impact on society. Transparency: We are transparent and accountable towards the NEM community. Collaboration: We are inclusive and involve the global NEM community. Integrity: We prioritise the benefit of the NEM project over personal benefit. We have strong principles and we are 100% committed to NEM. Focus: Focus allows us to translate our plan into achievements. Gratitude: We show gratitude for the technology, open source code and the NEM community which is the reason for the existence of our team. We view it as our duty to give back through our achievements. Continuous Improvement: We strive for perfection. We believe there is always room for improvement and are continuously working on making this happen. Reflection: We listen and reflect before seeking to be understood. Where do you see your organization in 2 years? 5 years? Further, we will have built a passionate team and an organization we can all be proud of. In five years, we will have made distinct progress towards achieving our vision. This means it will be crucial to achieve our objectives as outlined in our mission. At that point in time, we believe that NEM technology will have empowered people to regain control over their data and digital identity. We will have aligned NEM technology with market needs based on industry experience, resulting in companies building innovative applications that have a positive impact on society. Great questions, and equally great answers. This is an easy yes vote. 1. Please clarify to the community the number of developers currently on your team and the number that will be hired by your plan prior to July 1st. What percentage of your headcount and budget is allocated to these positions? We estimate a total combined technology and development staff (both programmers and direct support) to be ~21 FTE (Full Time Employees) out of 54 FTE of our proposed headcount in the proposal (technology and product team). This is a total of 39% in headcount and 40.3% in budget allocation. If developers contributing to budgeted projects are included, this adds a ~20 developers and project managers (2-3 project for up to 7 projects) excluding developers who may be claiming bounties. Conclusion: this would mean there could be over 40 devs and team members (FTE and devs from projects) by July 1st. Note: We included the Product Management team in our answer as they directly support the effectiveness of developers with scheduling, planning, communications, contract management, and time management. Other positions in the budget also have a core focus on promoting and supporting Catapult adoption. Link here to a list of our current tech talent. 2. Please share your team’s experiences with managing and hiring developers. How likely is it that you’ll be able to fulfill hiring goals and create a good working environment? Collectively, our team has at least two decades of experience across B2B, B2C and various dev studios. Our team members have led companies as entrepreneurs, CTO, co-founder, project lead and are able to meet the leadership demands in managing and hiring developers. How likely are we to fulfill our hiring goals? Likely. Since NEM Foundation started, we have come across good talent and passion for NEM tech both internal and through external third party alliances. We have a shortlist of talent to employ (upon funding approval) and will be engaging with external partners though the service provider model. Groundwork has been laid and we expect to complete most of our hiring goals to support the development of Catapult by the end of Q2 2019. How do we create a good working environment? With the new structure, collaboration and continuous improvement are key. Having the right proportion of senior to junior team members will ensure the NEM Foundation has a defined direction and delivers code/projects at optimal speed. Our priority upon funding approval will be to hire a seasoned CTO and bring in the appropriate mix of technical talent. Also, the Product Management team will directly support the effectiveness of developers with scheduling, planning, communications, contract management, and time management. This will help maintain a good and productive working environment for all. 3. Please describe the main contributions your current team has made to Catapult readiness to date. 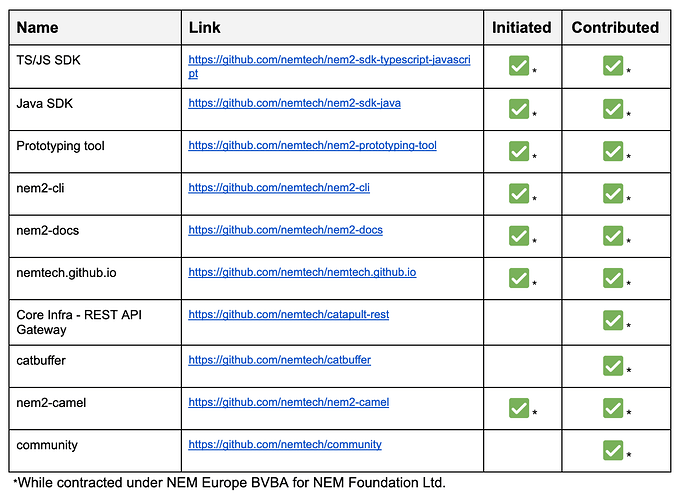 All current Catapult contributions to date have been completely funded and supported by the NEM Foundation including app development, training, documentation, marketing/promotions, and weekly working groups since early 2018. *The Center of Excellence (CoE) is a global initiative started in 2018 to centralize the NF’s development and contributions to Catapult. The CoE has been led by Kristof Van de Reck (under NEM Europe’s budget due to lack of designated budget being assigned to CoE.) Financial support for the CoE and NEM Europe has continued by the NF with the most recent funding of 3M XEM on 11 Feb 2019. It is undecided which EU staff may remain with the NEM Foundation or move to a new entity if funded. 4. Would you be open to a professionally managed, but independent, team of developers to make the push towards Catapult? Yes. We want to see Catapult succeed. Note: As far as professionally managed teams go, we are happy to work with them and hire them. We believe some pre-existing teams and long-established teams are better suited for some working projects and tasks and it is better to lean on their experience and existing toolsets than try to build everything ourselves from the ground up. Furthermore, hiring these teams helps to expand awareness of NEM outside of our bubble. 1. Please clarify your current financial situation. Is your team in debt, if so how much? Note: As of early January 2019, we realized after an audit that there were too few funds to sustain Foundation operations for the long term and therefore some areas of operations were suspended and all staff notified. We began the process of conducting global redundancy (suspension of services) of staff until a refresh of operational funding is secured but funds have been insufficient. There is not enough funding left to properly shut down NEM Foundation much less pay salaries for everyone in February. 2. What was the headcount of your team in 2018 and how does it compare to current headcount and projected headcount at end of 2019? We had 150 employees in 2018 and are projected to have ~54 employees (both fulltime and consultant) in 2019. We intend to keep the headcount low and work with partners (mostly development firms) who can support the delivery of our objectives. What will happen if your team does not get all the desired funding? Are there variations of your proposal that could work at lower funding levels? Would you consider working with one of the other team(s) who have made a successful proposal? If funding is not achieved, we will use all remaining funds to pay off liabilities, minimise debts and proceed to close the Foundation. The community will have to self-organise on the management of social media, partnerships, onboarding exchanges, managing complex global compliance issues, compiling case studies, commercialisation and sustainability of the NEM blockchain technology platform. The short-term and long-term impact on NEM of such a scenario is difficult to predict. 3. Would you consider working with one of the other team(s) who have made a successful proposal? We are responding on the assumption that currently the only team with a live proposal that may be successful is NEM Labs. If funding is not approved for our proposal, we cannot work with NEM Labs unless there is funding to support the teams in NEM Foundation to work with NEM Labs. Note: NEM Foundation is currently still supporting the NEM EU team (~15 people), most are behind the proposal for NEM Labs. We value the contributions of their developers and are proud to have funded their development in the past. If they are not funded and we are, we will look to retain their developers with their current pay structure and working environment maintained. This includes Rest API, SDK, and documentation devs. In fact, we have budgeted line items in our budget called “ 2nd layer devs (Like API server, Cat buffer, ect)” and another called “Documentation”, and another for “SDKs” that can be used to pay for their expenses if it comes to that, and if it doesn’t, we can hire additional devs to help support them and make sure Catapult is launched faster. Furthermore if they are successful, the NEM Foundation would still like to work with them to collaborate on different aspects of the NEM ecosystem. We are in support of NEM EU and their proposal for NEM Labs. 3. How much XEM will your proposal require at the current (0.04), 4x below (0.01), 4x above (0.16) XEM prices? If XEM stays at current (0.04) - we will maintain the proposal activation and initiate hiring as planned. If XEM goes 4x above (0.16) - we will ensure there is enough fiat to maintain our stated goals in reserves, and secondly, we will then expand our operations to cover a wider scope. 4. Please explain details of the independent oversight you will have in place to evaluate your performance. If the proposal is approved, we will be engaging an external auditor to provide oversight on our finances. We will be making public our KPIs for the community to provide oversight on our goals and roadmaps. Any contracts that were given to third-party companies will be going through a process of having the project announced via the forums and different companies can ask follow up questions and send in proposals. In the end, we will post which company has won the contract - this will be a form of oversight. The community will have full transparency where we are spending money. For work that is done internally and contributed by the NEM Foundation, we have a strict policy that all work must be open source and submitted to the PMC. So again, it will be transparent what work is being done by the NEM Foundation in house devs. 5. How are you planning to adapt to changing market conditions and evolving priorities with an annual funding cycle? Would it be beneficial to be more agile and request funding from an independent oversight committee more regularly (e.g. monthly or quarterly)? We plan to adapt to the changing conditions and evolving priorities by keeping all funds secure in the Singapore entity and only release on a monthly/quarterly basis based on market conditions. There is a need to have control via an annual funding cycle because terms for professionals are in 1 year contracts, it will be difficult to communicate to team members that they have monthly or quarterly reviews where their jobs/remuneration where there could be a risk that funding might not be disbursed. 1. What is your vision for NEM and how do you hope to achieve it? VISION: Be the onramp for the global economy through the principles of decentralization and tokenization. We have developed a ‘brand brief’ which you can view here. We exist to serve and support the best interest of the NEM community. See our community best interest policy here. We do our best to communicate often and in a timely manner. We respect the work and effort of our team members. We respect the NEM blockchain, the developers behind it and the community. We aim to be professional in all our dealings. See our Code of Ethics and Conflict of Interest Policy here. The core devs have work for NEM since Q1 2014. This new Foundation acknowledges their grit and commitment and would like to be as committed to serving main dev needs as the developers have been support NEM’s needs. 3. Where do you see your organization in 2 years? 5 years? Focus on deepening our open sourced ecosystem growth through the Project Management Committee (PMC), Special Interest Groups (SIGs), and Service Integrators. Catapult fully operational and commercialized in the public chain and various private chain implementations, helping to expand the ecosystem, development, and community. NEM Foundation aims to be fully sustainable over the coming years. In fact, it would be generating revenue and provide a constant flow of income for NEM instead. Lead the way in setting best practices, industry standards and providing thought leadership in the blockchain and cryptocurrency space. There should be highly successful projects that are making a genuine impact in the world through the use of the NEM blockchain. Thank you for your response! This is a sound and serious plan that seems to me intended to hold the foundation to a wholly different level of accountability and transparency. I will be eagerly awaiting what this holds for NEM future- this is what we needed from the beginning of NEM- better late than never. The new NEM Foundation team seems good. I hope we get to see that positive momentum continue. Thank you for the conscientious response I can see that all this is thought thru with careful due consideration. Good job. Very good questions! Hope these questions can help set up more reasonable regulations.I believe reasonable regulations rather than human nature. Thanks @nzminer, @okj, @teuthis, @jazzthatway - the council has been working around the clock (literally with all the 7 timezones we are based from) to ensure that NEM Foundation continues on. I would like to emphasise that unity has been a key highlight in the values we carry. We get into very healthy debates and discussions during council meetings but the outcome always leads to unity in decision-making. Besides that, respect for each other’s work has been a driving point. We respect each other’s effort and bigger than that, we have learned to respect the community who ultimately decides the fate of the Foundation’s future. We also respect the initiative by the NEM EU leadership to initiate the NEM Labs proposal and have jointly agreed between council members and the NEM EU leadership to support each other’s proposal. The history of NEM is still young (in a sense) and let this be a defining milestone to remember for years to come. This the sort of stuff alot of the community want to hear! Trained Enterprises/Startups in Catapult - how exactly? Malaysia SDK for java - where can it be found? Catbuffer - where can those contributions be found? Catapult Test Case Scenarios (utilizing Cucumber) - where’s that / who did that? Prepared certification framework to ecosystem partners - what is that, where are the details? is LA creating another Java SDK or does this one have anything in common with Malaysia Java SDK? As soon as the reference SDK (TS/JS) is up to date, we will address Java since we have demand for it. However, if there are already multiple teams working on it, we can also go straight to C#. We have the knowledge in the team to address either language. My bad, I did not know it was just a conversion of the existing nem-test-vectors. Great feedback and I’m working with the regions now to clarify. Answers will be compiled under one response so it’s easier to follow along. Also, quick note to community. These kinds of discussions are healthy and good to have. I’m glad we are having them in the open for all to participate.